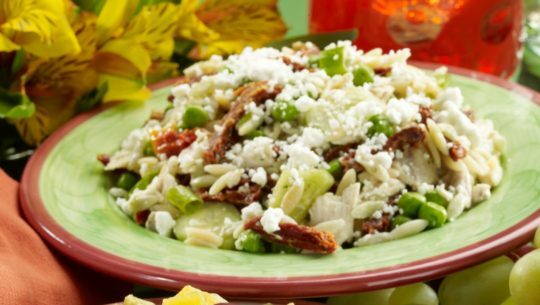 Featuring chicken, peas, sun-dried tomatoes, and feta, this fantastic, marinated light pasta salad combines bold flavors with great ingredients. In large bowl, combine orzo, chicken, peas, green onions, feta, cucumber, toma¬toes, dill. In another bowl, whisk together reserved sun dried tomato water with remaining ingredients. Toss with orzo mixture. Refrigerate for at least 1 hour before serving. Terrific Tidbit: To reconstitute the tomatoes, pour 1 cup boiling water over them and let sit for 15 minutes or until soft.